Redefine “easy bake” with this two-minute, one-mug dessert. Ingredients like brown sugar, applesauce, and fresh apple bring classic fall flavor to this quick treat. 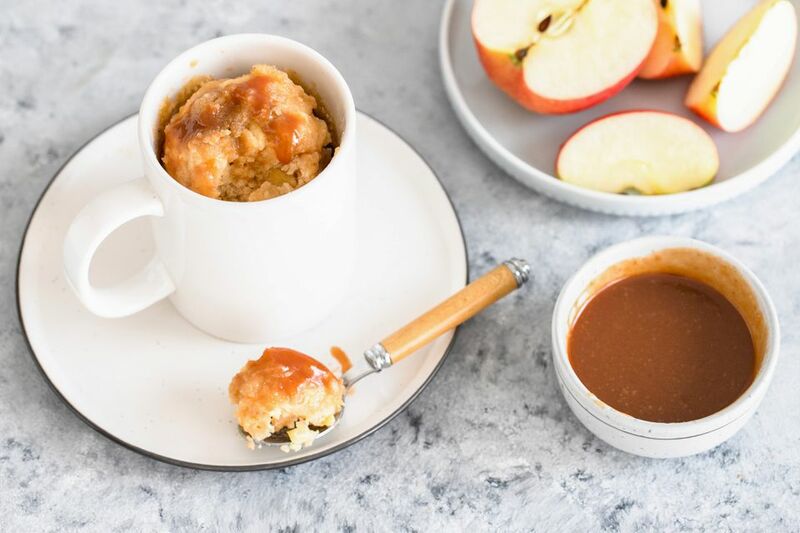 After a minute in the microwave, your apple cake is ready for its apple pie toppings: warm caramel sauce and streusel. Tasty as cake, easy as pie. Start by making the streusel topping. In a small bowl, combine the flour, butter, and brown sugar. With a fork, mix and mash until you have a crumbly texture. Combine the flour, sugar and baking powder in a 12-ounce mug. Add the apple sauce and mix well. Add the milk and diced apples but only mix lightly. Cook on medium-high in microwave for about 1 minute. Microwaves vary, but you’re looking for the cake to look done, and the edges to pull away slightly from the cup. While still warm, add the streusel topping and drizzle with caramel sauce.